Are Your Pipes Being Crushed by Tree Roots? While freezing temperatures are often responsible for burst pipes in the winter, trees and shrubs pick up the task during the summer and early fall months. These roots are incredibly strong and can crush a pipe and grow inside, wreaking havoc on your plumbing system and contaminating the water that flows into your home. Why Do Roots Do This? Tree and bush roots require oxygen to grow and are attracted to the water vapor leaving your sewer pipes. Because they thrive in warm, moist places, the nutrient-rich area inside sewers and sewer pipes is an ideal place for them to grow and thrive. Once these roots sense the presence of water vapor leaving the pipe, the search is on. They pursue the vapor to the moisture source through loose joints or cracks in the sewer pipe, and widen these gaps as they grow. Pipes most prone to infiltration by roots are made of clay. Cast iron pipes are much less likely to suffer this kind of damage. Once the roots have moved into the pipe, they often grow into many points, not merely one spot. 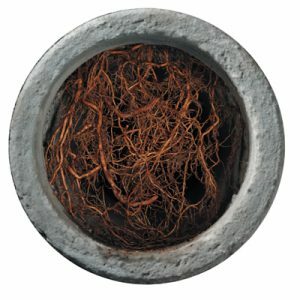 Hair roots, once small and fine, will develop into large roots that eventually break open the pipe. If they grow large enough to fully block the pipe, it can be incredibly difficult to dislodge the root or kill it with chemical treatments, so early detection is essential. Chemical treatments require at least a small amount of water flow within the pipe to be effective. If the pipe is fully blocked, the chemicals will not be able to surround the root and do their work. The most effective type of chemical treatment uses copper sulfite crystals, which can eliminate the need for further treatment. If you detect tree root blockage early on, you can treat your pipes with copper sulfite by placing it in your toilet bowl regularly in ½ cup doses and flushing the toilet a few times to make sure the chemicals flow through fully. While there may not always be ways to prevent tree roots from reaching your pipes, there are steps you can take to minimize/ prevent damage. Avoid planting a tree over a house sewer line: The roots will seek moisture in areas closer to them rather than in your pipes. Plant strategically: Maple trees, poplars, American Elm Trees, and Birch Trees all have shallow roots that are less likely to cause pipe damage. These trees also happen to grow more quickly, a side benefit of looking after your plumbing’s best interests. If you have noticed slow-flowing water in your home, tree roots may be the culprit. Contact Simpson Plumbing immediately for assistance.